At this time of year, our local farm stands and produce sections of the grocery stores are overflowing with peppers, onions, tomatoes and more. As soon as the calendar flips to September, my thoughts turn to big pots of stew, soup and chili bubbling away on the stove. 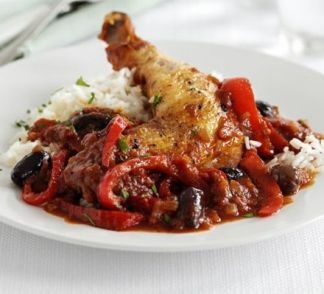 This Chicken Cacciatore recipe is also high on my list of one pot wonders; after a bit of slicing, dicing and searing, you throw in all in the pot and you’re done! Metro and No Frills have some great sales this week on some of the main ingredients for this delicious meal. This recipe calls for an ovenproof skillet, but if you don’t have one, not to worry, there are 2 alternate cooking methods that I will explain at the end. Also, I used the chicken leg quarters because they are on sale at Metro, but you can use any bone-in chicken pieces. I don’t recommend chicken breast though, as it tends to dry out. In a large ovenproof skillet, heat 2 Tbsp oil over medium high heat. Season chicken leg quarters with salt and pepper, then sear on all sides until a crispy, golden brown colour. The chicken will not be fully cooked at this point. What you are doing is creating lots of delicious flavor with this searing process, so don’t skip this part! While the chicken is searing, mix tomatoes, Italian seasoning, garlic and salt and pepper in a bowl. When chicken is golden brown, remove from heat and add your green and red peppers and onions to the skillet. Pour tomato mixture over the chicken and use a wooden spoon to help the sauce work it’s way down, but it will all settle during cooking. At this point, if you’re using an oven proof skillet, toss it in a preheated 350° oven and cook for about 40 minutes or until chicken reaches an internal temperature of 165°. Alternately, you may simmer uncovered on the stove top for about 40 minutes over medium-low heat. If you wish to use a crock pot, simply place the seared chicken in the crock and add your other ingredients (still mixing the tomatoes and spices before adding to the chicken. Cook for 3 hours on high or 5 hours on low. Serve with rice, potatoes or pasta, or enjoy all on its own. The sales run until Wednesday, September 20th. Happy cooking! Great recipe Michelle. It’s a great time for home made soups too. Made tomato basil soup in my soup machine last weekend. Long time no see!